The deadline imposed by President Jalal Talabani, pictured here in March, passed over the weekend. Official: "The country is almost paralyzed because of this decision"
Baghdad, Iraq (CNN) -- Iraqi political leaders were unable to meet a self-imposed deadline this weekend to decide whether to request U.S. troops stay beyond a planned end-of-the-year withdrawal, lawmakers told CNN. The deadline imposed by President Jalal Talabani passed over the weekend with lawmakers divided over how or even whether to request an extension, raising questions about when Iraq may ask and whether it will be too late to turn around withdrawing troops. "The country is almost paralyzed because of this decision whether Iraq will decide to keep some American troops after 2011 or not," said Kurdish lawmaker Mahmoud Othman, a close political ally of Talabani. Prime Minister Nuri al-Maliki said months ago that the White House would need to know Iraq's decision by August. Talabani's office declined a CNN request for comment. 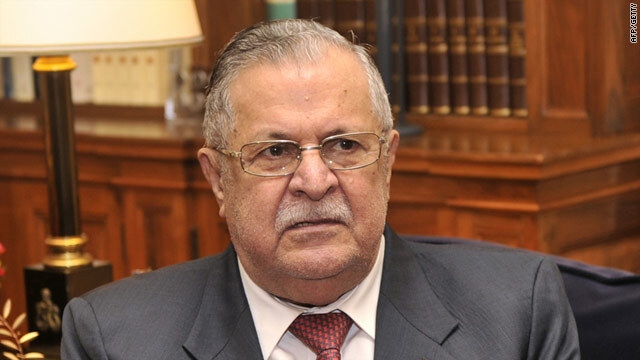 Al-Maliki's office referred questions to Talabani. During the meeting at Talabani's Baghdad office, the representatives said they needed more time to consult party members, Othman said. He was briefed on the outcome of the meeting by his party, the Kurdish bloc. But an official in the office of Sunni Vice President Taha al-Hashami told CNN political leaders decided to postpone the meeting "until further notice" because there are still disagreements over a possible request to extend the stay of U.S. troops. The disagreement extends beyond the closed door meeting. Shiite lawmaker Hassan al-Sineid told Iraqiya state TV Sunday that U.S. troops should leave as planned. "Let me tell you something, whether the Iraqi army is able or unable to protect Iraq's borders from external aggression, we shouldn't agree to keep some American troops after 2011," said al-Sineid, a member of al-Maliki's political party. Radical anti-American cleric Muqtada al-Sadr, whose Sadrist political party is closely aligned with al-Maliki, has vowed to escalate armed resistance if the U.S. military does not leave as scheduled, a move that could destabilize the country should the Mehdi Army repeat the bloody battles it waged against American and Iraqi forces during the height of violence. The Kurdish party, which represents Iraq's Kurdish territory, is pushing to keep U.S. troops, saying it wants some American troops to stay "for the benefit of the two countries." On the streets of Baghdad, Iraqis appeared as divided as their political representatives. "I don't want to see American troops after 2011," said 33-year-old Qassim al-Shammari, a businessman. He challenged Iraqi lawmakers to broadcast a meeting and make public their decision. But Habeeb Forqan, a 25-year-old government employee, said he wanted U.S. troops to stay for another few years "until the Iraqi army is ready to protect the country." "Every few weeks the Iraqi politicians give a new deadline to make a decision. It is a joke," he said. "This issue affects our lives, it affects our future. They should decide quickly." The failed weekend meeting comes nearly two weeks after newly appointed U.S. Defense Secretary Leon Panetta urged Iraq's government to make a decision during a trip to Baghdad. A U.S.-Iraqi security pact signed in 2008 requires U.S. troops to leave the country by the end of the year. While the U.S. military says it is not aware of any deadline imposed by either the Iraq or U.S. governments, it has pushed the Iraqis for a decision. "We have consistently said it becomes less feasible to support a new request once we begin reposturing our troops and as we continue transitioning bases and redeploying our equipment," Army Maj. Gen. Jeffrey Buchanan, the top U.S. military spokesman in Iraq, told CNN in an e-mail interview Sunday. The decision about whether to grant any request to extend the stay of U.S. troops in Iraq beyond Jan. 1, 2012, will be made by President Barack Obama. The debate comes amid an increase in attacks against the roughly 46,000 American troops still in Iraq. Fourteen U.S. soldiers were killed in combat-related incidents in June, the largest loss of life among American troops since 2008, according to CNN figures. There also has been a spike in the number of attacks against civilians and Iraqi security forces, with more than 270 people killed in June, authorities said. The U.S. military has said the Shiite-militias -- Kataib Hezbollah, Asaib al Haq, and the Promise Day Brigade -- are using the bombings to try to take credit for driving American forces out of the country. Tawfeeq reported from Baghdad and Carter from Atlanta.